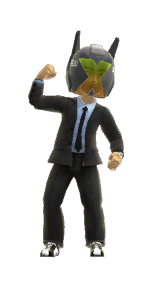 I am totally unconvinced by the Xbox 360 avatars coming in the NXE however I have it under good authority that they are actually quite cool. Either way I guess we are going to have to wait for the NXE to be officially released to see what all the fuss is about. However not all of us have had to wait, can anyone recognise the friendly chap on my right here? Please give a warm welcome to our local Xbox MVP Craig Nicholson, having met Craig a few times in real life I would have to say that this is a decent likeness. So how did I get that image without Craig’s permission or knowledge? Well it seems like these avatars are not going to be confined to the Xbox 360 and will be available for anyone to view by simply typing in the correct URL. While I am not sure how useful this is I guess it’s nicer than just putting a gamertag on your website or blog and if it’s available live on the net you could theoretically use it anywhere, I am sure some clever person out there somewhere is already cooking up a use for these little guys. So who else can you find who has used the NXE yet? Other than the famous Major Nelson that is who I have already found. And now that you know we can see you are you going to fake your avatar to look like Angelina Jolieâ€¦ I know I will, but then again I do look just like her alreadyâ€¦ or is it Brad Pitt?